To enjoy the major features seen in the demo website, you will be invited to install the plugins we have curated and recommended for your theme. You can either install some or all of them. 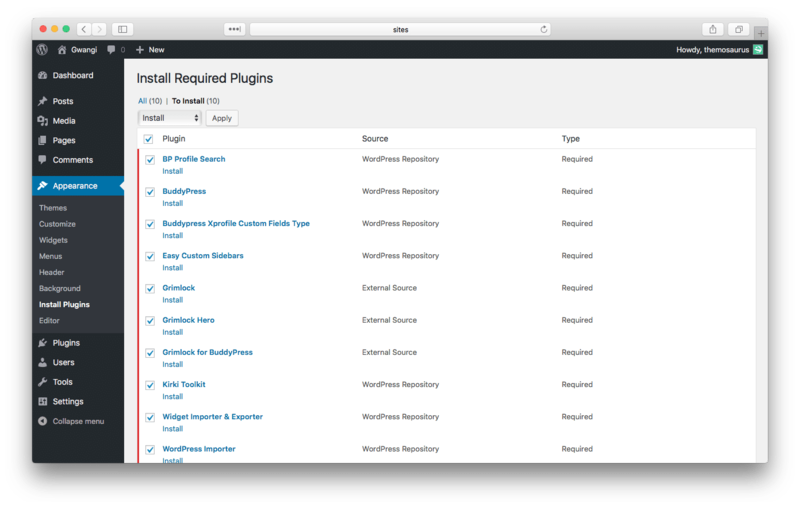 Visit Appearance > Install Plugins and select which plugins you would like to install. We recommend the bulk installation of all the recommended plugins. Once you’ve selected the plugins you want to install, click the Install option under Bulk Actions dropdown. This method refers only to major features from the demo website and does not include the installation of any premium or 3rd party plugins that are not freely available on WordPress.org. They are not required for your theme to work but most of these are free and can be downloaded on wordpress.org if you want to add features to your project. Can I use the plugin Visual Composer with your theme?